Product #15565 | SKU LCT140 | 0.0 (no ratings yet) Thanks for your rating! The Lewitt LCT 140 is an extremely versatile, easy-to-use, compact 2/3-inch back-electret condenser microphone, perfectly suited for quality-conscious casual users. Its low-mass diaphragm delivers an exceptionally clear and natural sound, making it the perfect fit for a wide range of live and studio applications including drums and percussion, acoustic instruments or even vocal ensembles. Thanks to its uniform cardioid pickup pattern that effectively suppresses off-axis sound, a wide dynamic range of 124 dB and its very low self-noise, the LCT 140 adds transparency and distortion-free detail to every sound recording. Its transformerless output design makes it immune to electromagnetic interference. The LED display can optionally be switched on and off for better handling in different environments. 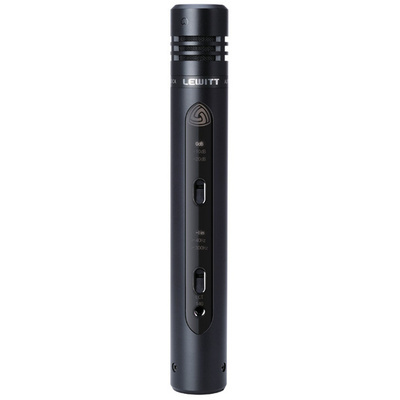 In short, the LCT 140 is an extremely versatile all-rounder microphone.